A Big, Fat Juicy Update this Week! 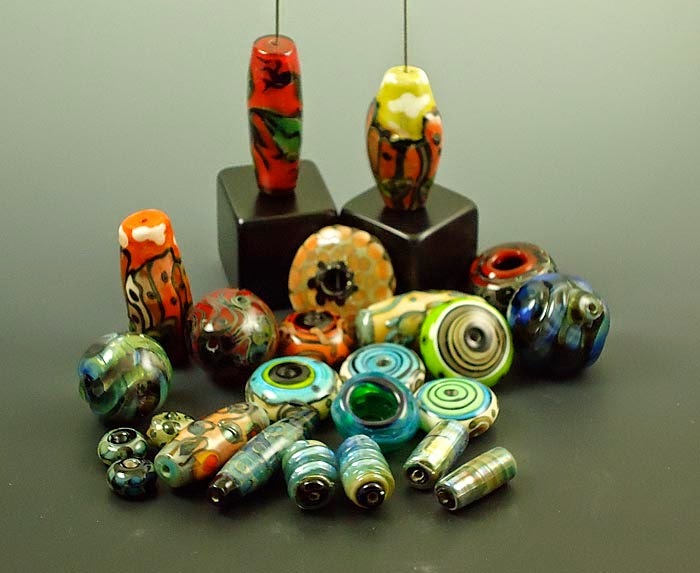 Over 170 new items this week, and we have quite the range too, from sublimely delicious gemstone beads to fun and funky Resin Cabs. First up - coloured stone beads. Beautiful semi-precious stones - from Peridot to Labradorite to Tourmaline. Just divine! I could ramble on and on about the Tourmaline multi-color mix, the Blue Topaz, the Amethyst (Gawd - I just LOVE amethyst), or you could just go look at them all together on their own page! 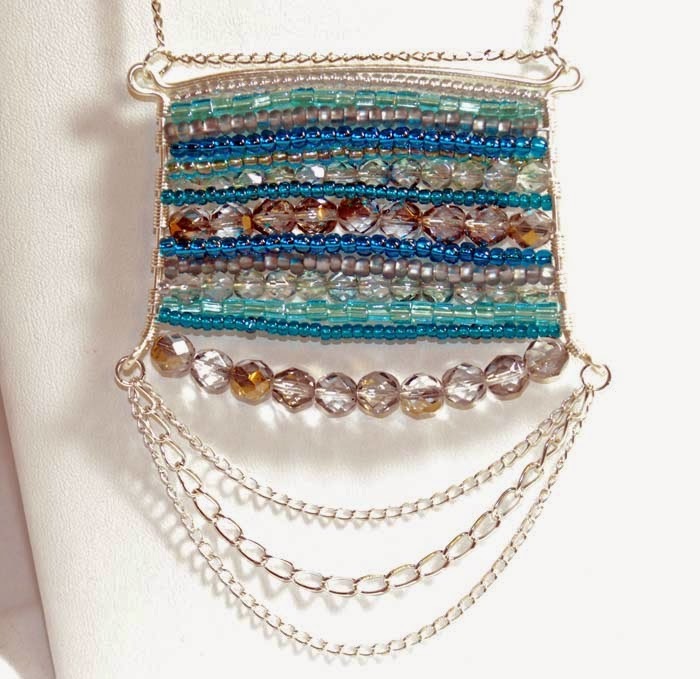 And if that were not enough - we have gemstone chain - where the stones are already wired up into chains, just add clasps and you are done, or combine with strands of strung beads or more chain for a multi-strand fantasy. My p ersonal pick of these is this simulated Alexandrite - which is a soft blue at the office in fluorescent light, and an ethereal translucent purple in sunlight. 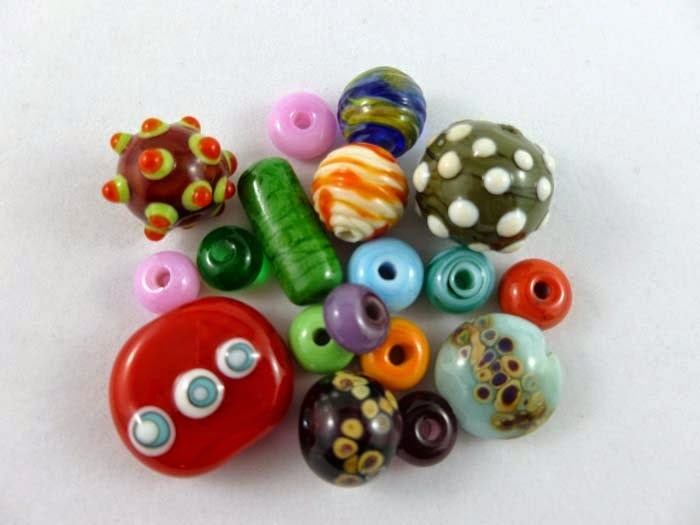 We also have some that are tiny little 3 mm beads, wire wrapped on links and strung together. 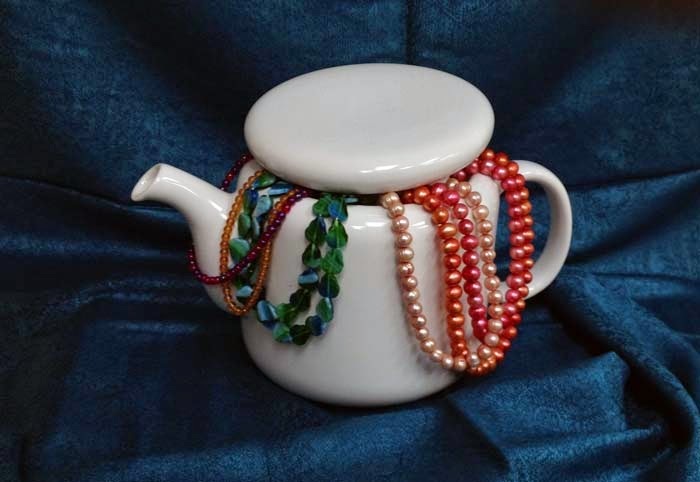 Sure, you could grab some beads and do the work yourself, but it is fun to loop some strands of this and just go! And if the chain doesn't quite suit you, we also have gemstone links and pendants - the stone part without the chain. Small links and small pendants, oh, and some larger, striking channel-mounted pendants. Some of these bigger pendants are one-of-a-kind, so don't linger on them. There are more selections in store too, in case you are coming by in person! But wait, there's more! Because we have a new batch of a new stone for you! Larvikite (from Larvik, Norway), otherwise knows as Black Labradorite or Norwegian Moonstone! Similar to Labradorite, with some flashes of blue but a larger patches of colour and an overall darker hue. If you love a neutral stone colour - you'll love this. Now - about those cabs - these are the other end of the scale - fun, funky, and fashion-forward. Fashion Forward is the opposite of Heirloom, in case you were wondering ... . ;-) Neon colours and "Sugar" stones. We are closed Monday for the Civic holiday - the store is, anyway. The website never sleeps! Click on a link or image above, or get started with all the new items here. Special Treat if you love Raku Ceramic! 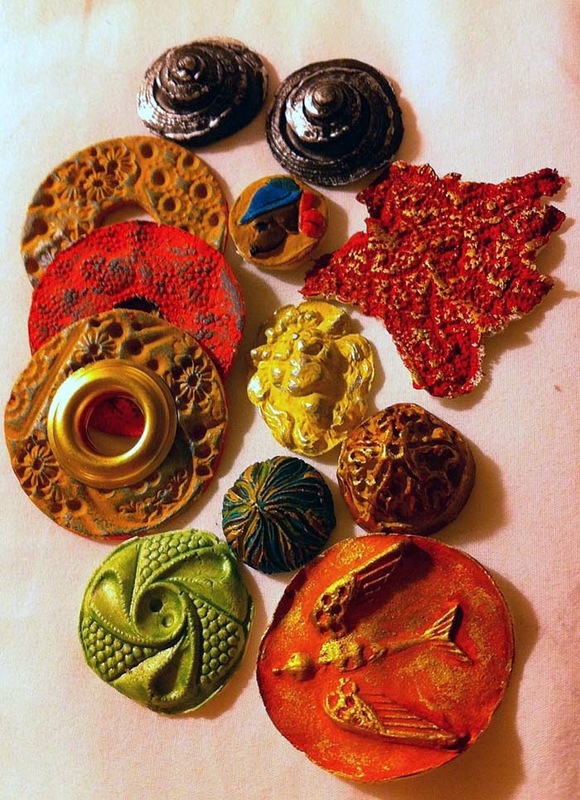 On her last buying trip - Marg picked up a bunch of lovely ceramic Raku pendants from Urban Raku! 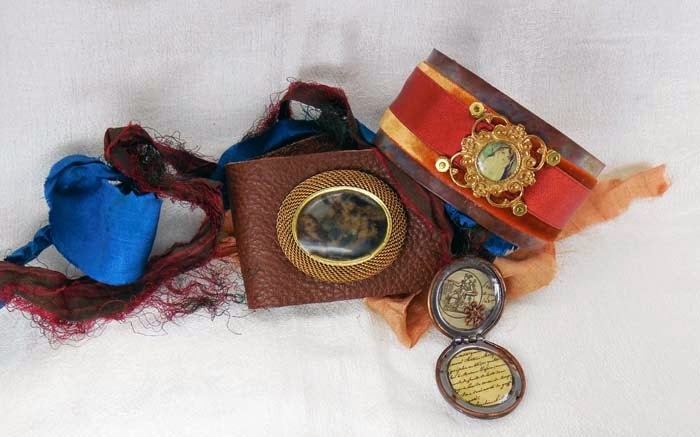 As each one is handmade and unique and one-of-a-kind - we're not going to be putting them online. But they will be in-store - so if you are in the area, or planning a special trip to see us - be sure to check these out! 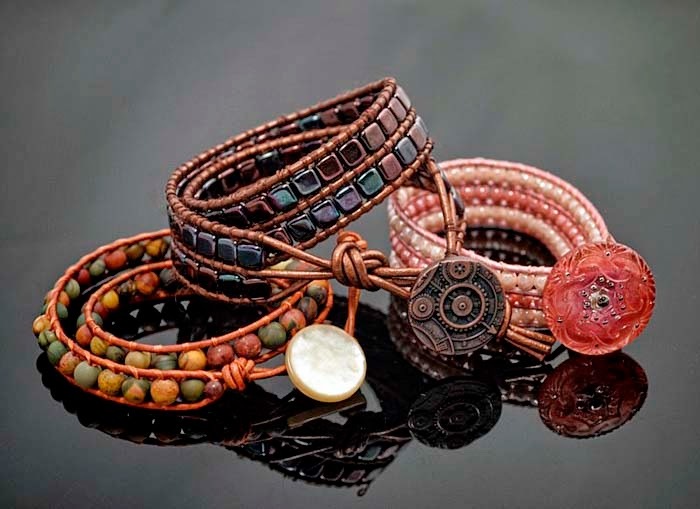 They range in price from $12 - $24 and have lots of design possibilities - from a simple pendant on a leather cord to stacking them or combining with bead weaving! Just one day left to exercise your Sale Options! Time to get in Shape - Round Is A Shape! 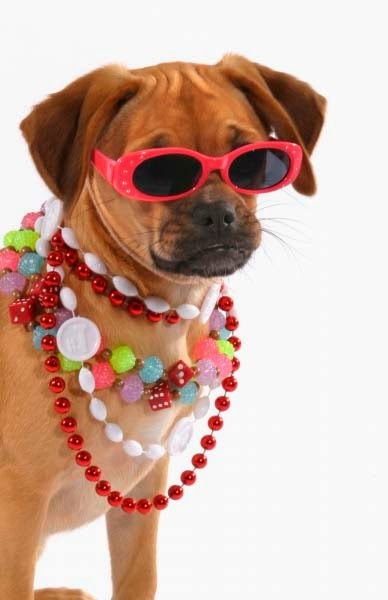 Turn those Dog Days of Summer into opportunities to learn a new jewellery technique! August hasn't stopped our creative instructors from bringing you lots of classes - including some new classes and projects. Note: our classroom tends to be on the cool side, so you may wish to bring a light sweater or shawl with you. 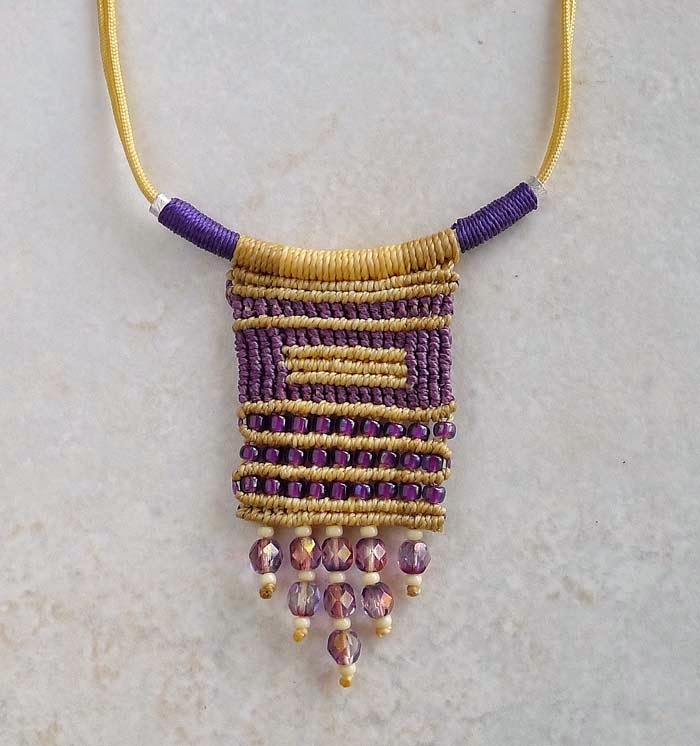 In early August we welcome two new instructors to BeadFX. 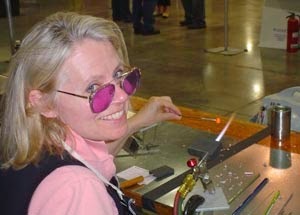 We are especially pleased to bring lampwork and glass artist Sara Sally LaGrand in for two exciting lampwork classes. Come on out and meet Sara at a reception for her on Thursday, August 7! 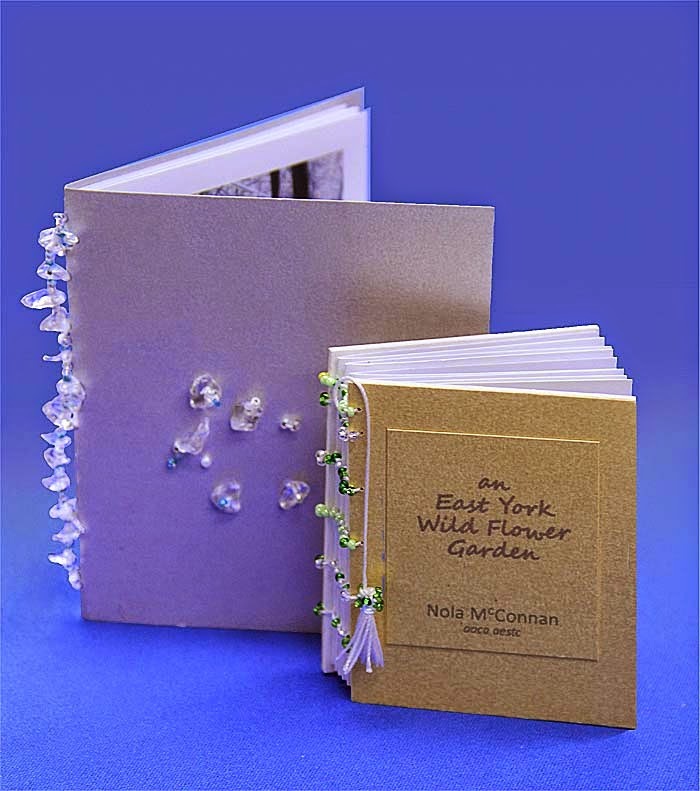 Also new is Nola Merriweather, a local East York instructor, who will be teaching an introductory course on creating and embellishing small books. Come on out and meet Sara! 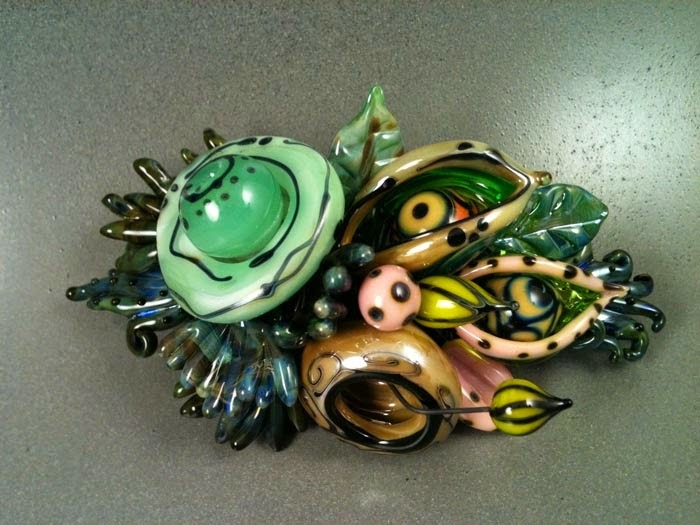 Lampwork - Just a Taste! Complete details, including class and kit fees, are on our website. No Dazzling Bling shall escape my sight! It's dangerous putting out new stock in the store - I get so inspired by the products and want it ALL! Who doesn't love a big, glamorous Swarovski ring? 10 minutes work, a lifetime of compliments! 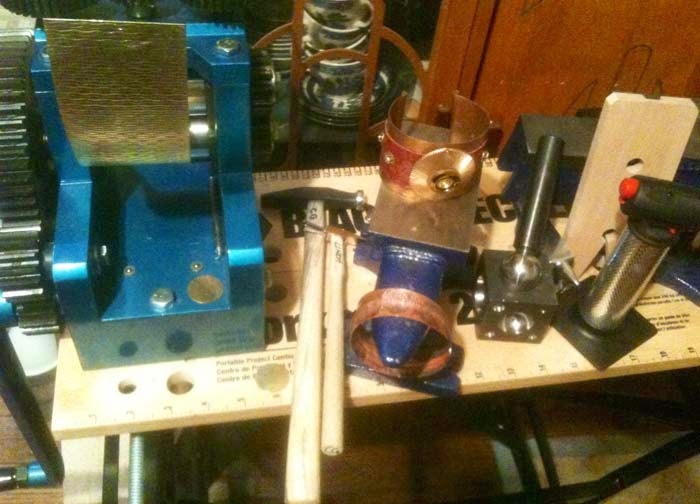 Cut the leather strip to fit, and dry fit into the slider. Remove and glue with the join hidden inside the bead! Wait for the glue to dry before wearing. Or you will be wearing it for a lifetime! 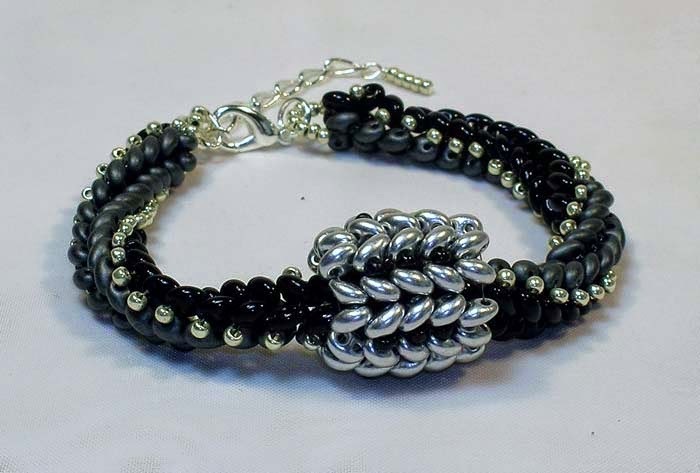 I wanted to make a simple bracelet that would be nice to wear through the summer. Light colours lead me to the jade. Seeing the new fish clasp inspired a watery theme. The rest all fell into place, with a splash! Put one end of the leather in the end clasp and squeeze shut. 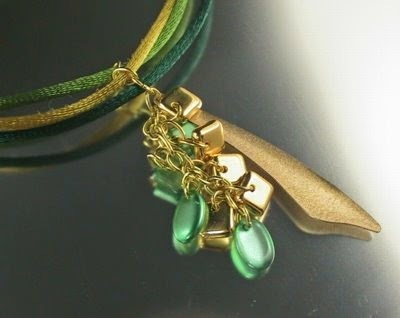 You can use the fish clasp as the focal for your new bracelet. As always in the crafty world lately I’m hearing a lot of whining about slow sales. “It’s the economy, it’s the weather, it’s construction, the organizers, too many competitors”. It’s always something that you can’t control. You know what? No matter what something will always be out of your control. It will never ever be a perfect situation for selling. Maybe you should focus on what you can control. I’ve been thinking a lot about this lately. Because I am having a really great year. (I almost don’t want to say this out loud in case I jinx it). My online sales are up. Every single one of my shows so far has had increased sales over last year. I was telling someone about how things were really good for me and her first question was “why?”. It’s a mighty good question, why am I doing well and others not so much. Because if I can figure that out maybe I can keep doing it. In other news, the other day for the first time in forever I went into a large department store. I have to say, it was a horrible experience. The building was run down, there were no signs to tell me where to go, the displays were poorly done and ugly, the place felt like something my grandmother would shop at. The whole time I was there all I could think was that this store was a relic of the past and did no one from head office ever set foot in there to see what was happening? With these 2 trains of thought running through my brain this morning I read a long article about how 3 major Canadian chains are running into serious retail trouble. Sears Canada, Reitmans and Indigo are all facing a battle for survival. It is a very interesting read and something we should all pay attention to. It’s important not just because these stores are in our neighbourhoods, but because we can learn from this. Here are some lessons I learnt from this article. “Years of complacency, and a failure to innovate, could spell the end of many Canadian retail brands,” said Craig Patterson, a retail analyst and the founder of the Retail Insider. If your customers aren’t buying from you maybe it’s because you don’t have anything new for them to buy. Or to look at. I recognize that not all of my customers will buy every time they stop by (either in my booth or online). Of course they won’t. What I want is for them to continually come by, at some point they will buy and buy again. To keep them around I need to come up with new work on a regular basis, give them a reason to come back. “They didn’t, and they don’t, understand their customer,” continued Craig Patterson. Here he is discussing poor merchandising choices, such as Sears stocking lawnmowers in stores in downtown Vancouver where EVERYBODY lives in a condo. OK crafters, do you know your customer and what they want? Are you selling in the right venues? If you are a painter who insists on making 8’ x 12’ wall pieces have you considered where people who are living in tiny condos will put your art? Maybe you should make prints in smaller sizes. If you are a jewelry designer making huge statement necklaces costing $1,000 then perhaps trying to sell to a bunch of soccer mums in a middle class neighbourhood isn’t the right place for you. “People keep going back to some of these horribly dowdy stores thinking ‘there’s nothing here that I want’”. That is EXACTLY what I thought when I went into that department store. The ironic thing was that I knew that had something that I wanted but it was so ugly, so uncared for that I couldn’t be bothered looking for my item. Take a look at how you are selling your work. Is your booth or online store enticing and spiffy or does it look unloved? Display is so critical to your success both online and at shows. With so much competition around your space must make people (the right people of course) want to come in and find something to buy. As I read this I was thinking about why I’m doing well right now. Here’s what I have done that Sears Canada didn’t do. I have a new website and it’s usually up to date with new content. I painted my outdoor booth, put up new photos and changed up my display (not much but enough to look fresh). I have a lot of new work so that long time customers can find something new to buy. I think this is what is working for me. There are so many things we can’t control, like the economy, the weather, our competition. It’s really easy to blame outside factors for our lack of success. Why waste energy on that? Take a look at where you are today think about what you can control. What can you do today to make sure you don’t end up in the same boat as Sears Canada? Sale this week - time to get in SHAPE! I am in Shape - Round Is A Shape! The Business Chat - All systems are go! The Business Chat - What will make you happy? On sale this week - Bling it On! The Business Chat - Financial sanity step one. A-Roving we will go ..